When I first saw a photograph of an inventive quilt made by the Chicago-based quilter Sarah Nishiura, I thought I was looking at an abstract painting. The fascinating geometry, surprising lines, and the hues of colors enticed me to feel something completely new. 2017 Quilt by Sarah Nishiura. A quilt has much more purpose than a painting in Sarah’s view. “Quilts are meant to be touched while paintings are generally not. As a painter, the brush was always an intermediary between me and the thing I was making. When I quilt, I touch every inch of my work as it evolves. And similarly, touch is a very important part of the viewer/user’s experience,” she explained. Sarah was taught to quilt by her mother, whose own mother made quilts by piecing together feed sacks during the Great Depression in the late 1920s and early 1930s. Sarah’s Japanese-American father’s family was held in an internment camp during the Second World War, where they gathered wood scraps to create altars for people. Sarah hand-quilts all of her work instead of by machine because she likes the way the lines look. 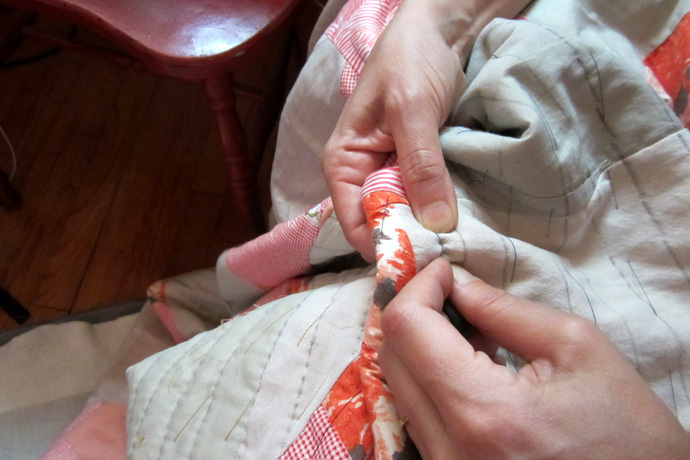 It is a slow process but she feels that the pace of quilting is what makes the final product so special. 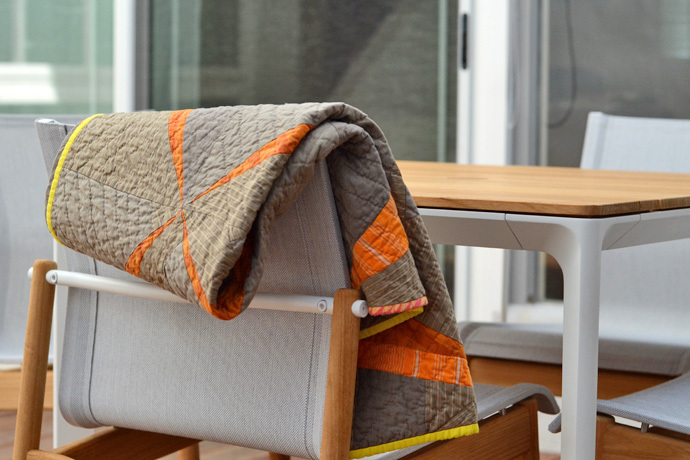 By creating beautiful quilts that provide warmth through the piecing together of otherwise discarded fragments from the past, Sarah finds a connection to the ingenious creativity of her ancestors who created useful and beautiful things out of nothing. Sarah gets her greatest inspirations from quilt history. “I love looking at quilts made in the past, analyzing their designs, how they were made, and also thinking about the context in which they were made”. She occasionally takes a deep dive into the collections database of The International Quilt Study Center in Lincoln, Nebraska where traditional quilt patterns can be searched with examples of hundreds of variations of the same pattern. 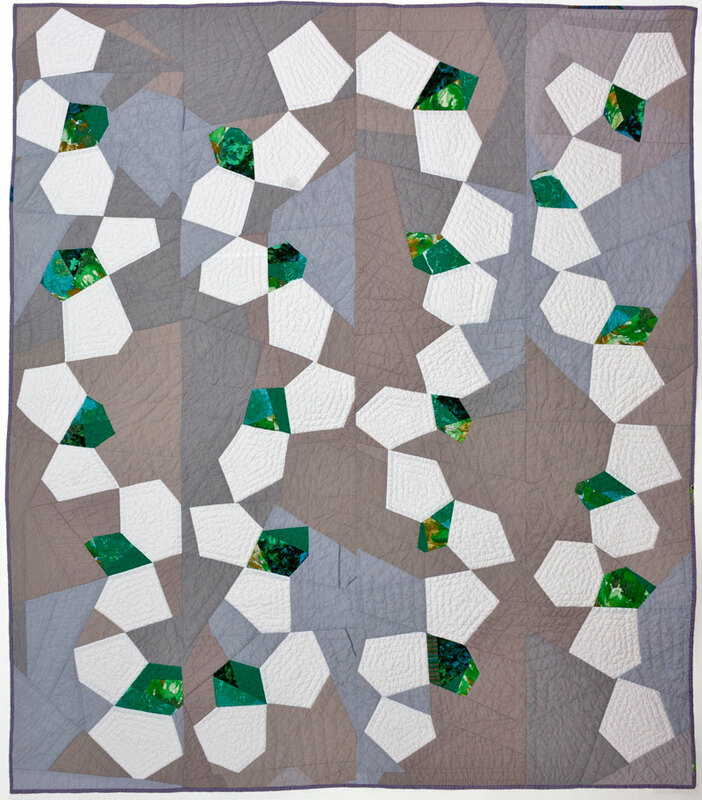 “One thing I love to do when designing is to challenge the geometric relationships that have traditionally been used in quilting. Figuring out how to warp a grid or shift proportions within a composition is a really fun puzzle and can open up endless possibilities and create some really dazzling effects,” she said. Indeed, a quick Internet image search of Sarah’s name will pull up quilts with numerous innovative designs that she has created. Given Sarah’s gift and passion for geometry, it is no coincidence that her father was a mathematician. Quilt designs by Sarah Nishiura. 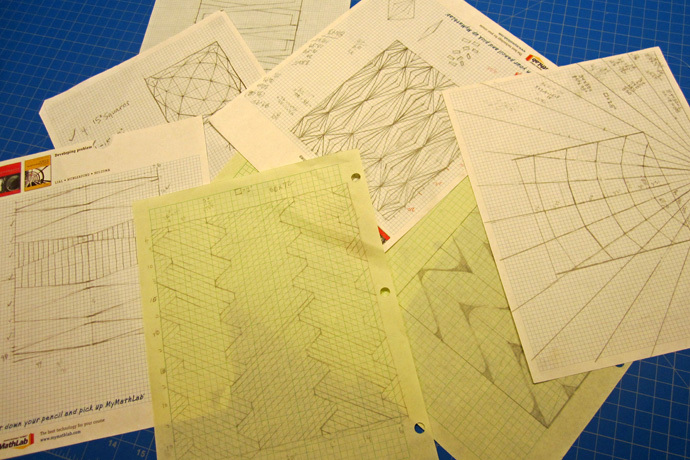 She loves figuring out how to warp a grid or shift proportions. 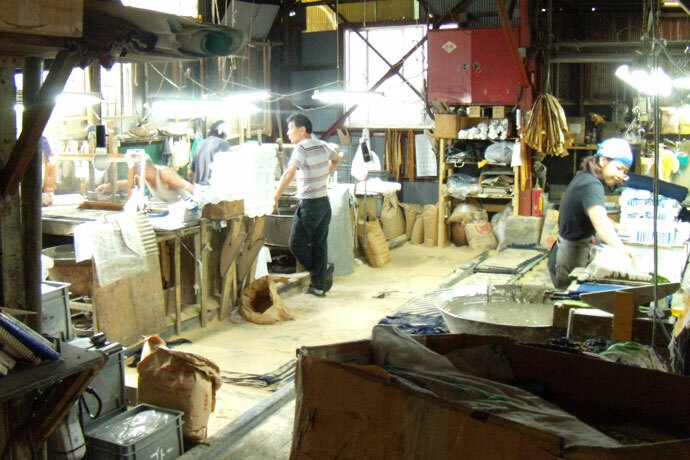 Yanagi Muneyoshi, the founder of the Mingei movement once wrote in an essay titled “Nature of Folk-Crafts” that the most essential quality of folk-craft is its nationality, because it directly reflects the life of that nation. When Sarah remarked that “a quilt is made of many different materials that all have to be made to play nice together”, this made me think about the openness and inclusiveness of quilts and how synonymous it is with America, where the quilting tradition thrives to the present day with more than 16 million quilt makers. 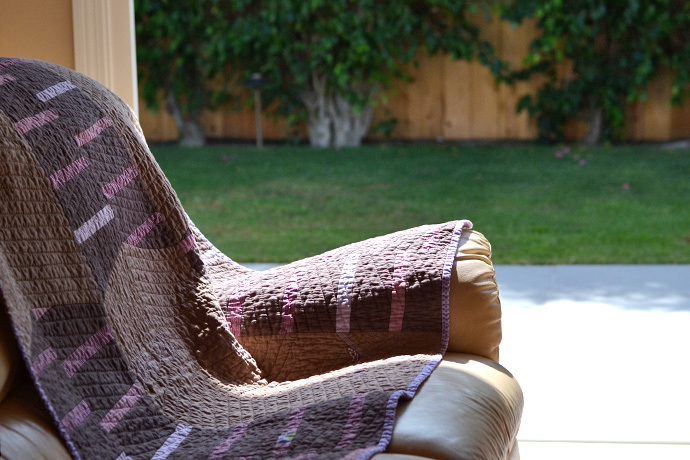 A quilt’s most special quality is its intimacy. “The desire to play with geometric pattern is only one part of the game” says Sarah Nishiura. 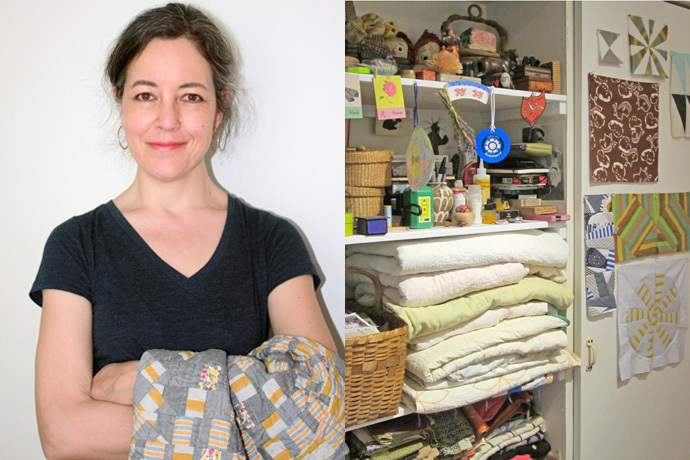 I understand why Sarah does not want her quilts high up on walls, but want you to keep it close and take them into your hands. It is because the most special quality of her beautiful work is in its humility and intimacy. Why do some designs appeal universally? This most vexing of questions is often on the mind of Japanese artist Harada Fumiko as she creates her textile designs. Her answer can be found in the bold patterns and beautiful colors featuring a diverse variety of subjects that are central to her work. 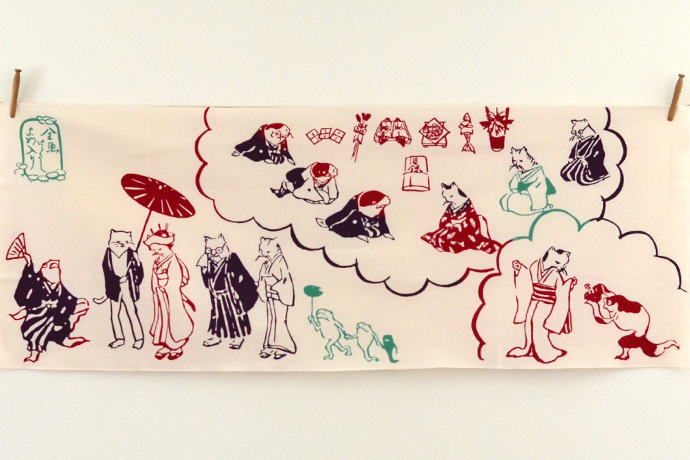 Tokyo Tenugui designed by Harada Fumiko depicting a wedding between a cat and a goldfish. This tenugui was created in homage to the great ukiyo-e master Utagawa Kuniyoshi who is known for covering many genres, including a group of prints featuring cats. Harada-san says that, “there are variations in the sensibilities of different generations and cultures, but designs that appeal to the hearts of many are universal”. Her designs are full of allegorical references to culture and traditions mixed with humor and wit. 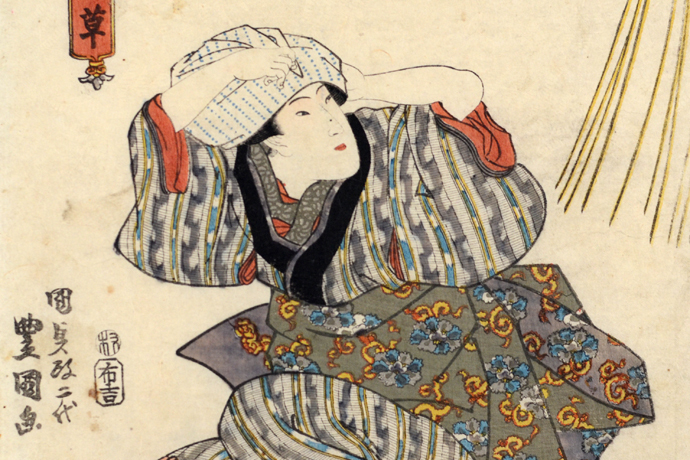 They are reminiscent of the works by the masters of Edo period ukiyo-e or woodblock prints that continue to enchant people across borders and generations. Harada-san calls her brand ‘Play on Words,’ which is synonymous to her style of work. Tokyo Tenugui by Harada Fumiko is full of word play and wit. In this motif, the goldfish is shopping for umbrellas from a bat and jewelry from a swallow. The first western style umbrellas brought to Japan were called “bat umbrellas” because of their similarities in shape. The swallow with jewelry is a reference to Oscar Wilde’s “The Happy Prince” story. Harada-san has loved textiles from a young age. She was fascinated by how designs and texture on fabric showed different expressions from paper. In her late teens, she spent all her money from a part time job buying second-hand vintage kimonos dating from the early 20th Century. “Luckily I was short and so all the old kimonos fitted me perfectly,” she chuckles looking back at her atypical adolescence. Her early passion turned into the desire to study and learn about textiles and designs. She was especially impressed by Charles Rennie Mackintosh, a Scottish architect and designer, whose work was featured at an exhibition in Tokyo that she went to see. “I was very attracted to his attitude which valued craft.” Harada-san eventually decided to study textile design at the Glasgow School of Art, whose main building was designed by Mackintosh and was the center of the Arts and Crafts Movement in Scotland in the late 1880s and 1890s. 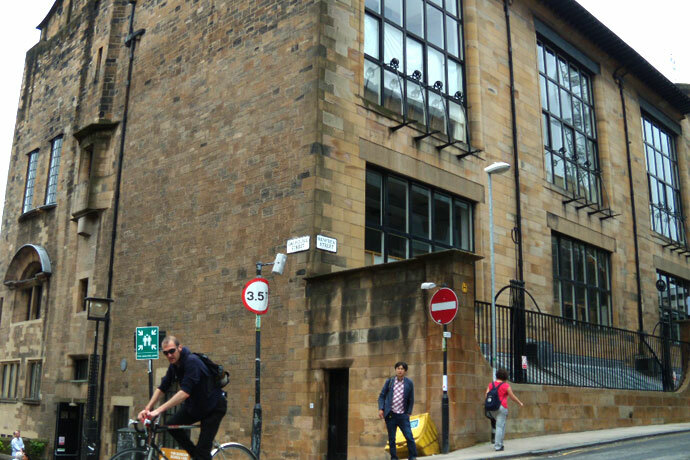 “I chose the Glasgow School of Art because it offered a project-based curriculum, rather than the technique-based style of classes taught at Japanese universities,” she explains. She also felt that the British curriculum was more suited to her approach, which was to be able to create what she envisioned while considering the advantages and disadvantages of both handcraft and machines. Industrialization and the demise of handcraft had occurred much earlier in Britain than in Japan, so the British curriculum helped her consider and balance these aspects. 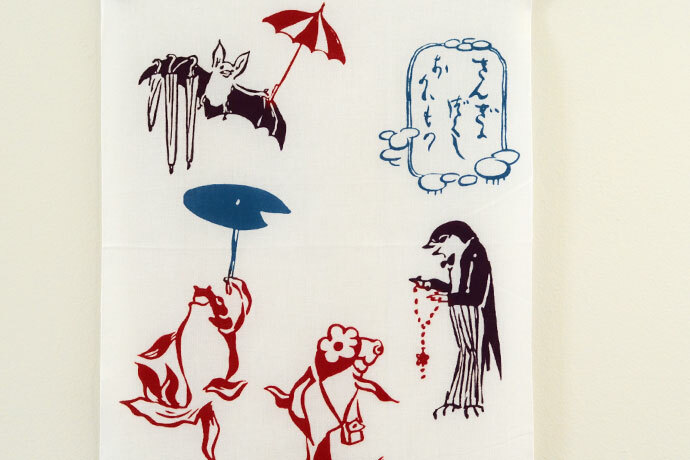 One of the current projects of this globally minded artist is the design of tenugui, the all-purpose Japanese cotton towel that became popular among ordinary people during the Edo period. Tenugui are still very popular in Japan today and people use them for a variety of purposes, such as dishtowels, potholders, and even as head-covers, a tradition that started in Edo. The technique used to create tenugui is called chusen, which is a relatively new method devised in the early 20th century to dye about 20-25 sheets of fabric at the same time. In chusen, a stencil is used to apply a ‘resist’ to each of the approximately two-dozen layers of fabric that are folded and stacked on a vacuum table. The dyer then uses glue on the top layer to create barriers to separate different colors of dyes. Finally, the dyes are poured from the top and pulled through the layers using vacuum pressure that creates identical patterns on both sides of the fabric. “I’m attracted to the fun of designing in a limited space (tenugui are approximately 13 inches wide and 35 inches long) and the beautiful effects of blurring”, Harada-san explains. In many other types of dyeing, color is applied or printed onto the surface of a fabric leaving a crisp design. Chusen, however, drenches the fabric’s fibers in dye, leaving room for the colors to mix and the edges to blur into a very appealing effect. Although mostly a manual process, Chusen provides just the right amount of mechanical aid to lessen the labor intensity while providing room for the craftsmanship to shine. 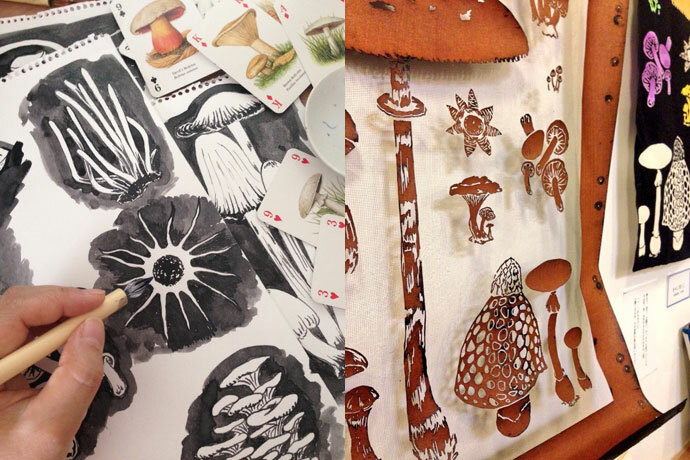 Harada-san draws each design by hand, which is then carved by a craftsman into a stencil. “Too much detail cannot be expressed in chusen, so I adjust the design before the stencil is created”, she points out. The greatest appeal of chusen is that it is a collaborative process between the designer and the craftsman. 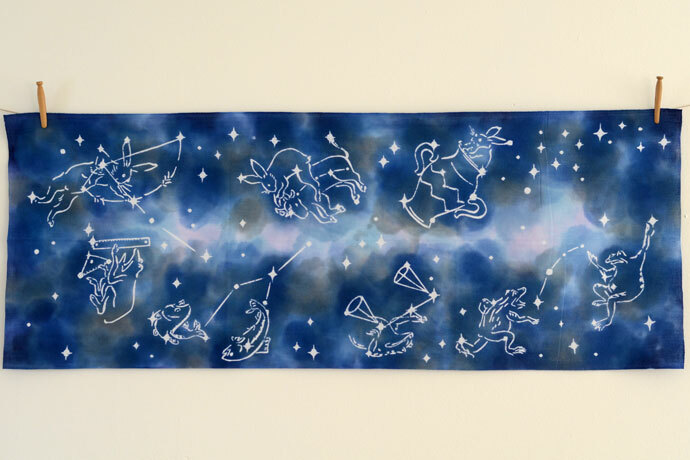 In her giga choju tenugui, which was created in homage to choju giga, the oldest animal caricatures from the 12th-13th Centuries found at Kosanji temple, Harada-san explained to the craftsman that she wanted to express the galaxy and attached photos from NASA to illustrate this idea. The craftsman created the different shades of blue, together with just the right amount of purple and moss green and the galaxy was expressed beautifully. Giga choju Tokyo Tenugui designed by Harada Fumiko in homage to choju giga, the oldest animal caricatures from the 12th-13th Centuries found at Kosanji temple. It is a play on the Japanese word ‘ginga’, which means galaxy. The craftsman mixed different colors to express the galaxy to great effect. Harada-san recently started printing designs on larger fabrics and hopes to broaden her textile design opportunities into a wider range of materials in the future. She also hopes to expand her corporate branding design work in which she effectively uses modern design while referencing the tradition and history of the company. We are very pleased to be able to introduce Harada Fumiko and bring her beautiful work to the U.S. for the first time. I’m sure the Glaswegians are proudly saying “gaun yersel!” to this talented Japanese artist.